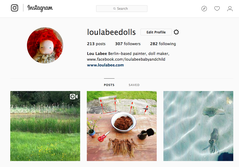 I am the person behind the label Loulabee since 2007, trying to make dolls during my daily creative chaos. Happy to create these little people and share them with you. Their stories are fictional, but also have many things from my children and from our daily life. As an artist and a doll maker, I work mostly with heart and hands. Basically the hands follow the heart. The heart sings, the hands dance. As soon as the brain gets too loud, the hands cannot produce anymore. It is for me the same either I am painting or making dolls. I never know at the beginning what the result will look like. When I am painting I have a canvas, so I know how big the painting will be. The rest is just pouring the heart onto that space. I don’t know what makes me satisfied with the painting, what makes me say, when it is finished. As I am making dolls it is similar, I basically know how big it will be, but not even know if it will be a girl, boy, blond or black… I just have a bunch of wool in the hand and the journey starts. Sometimes I am happy with it, sometimes not, but It is always surprising at the end. I believe that a doll is a product which comes from the heart. Thus if the doll maker’s and doll lover’s hearts sings the same song they find each other. Happy to have you here, sharing our moments of our life through my dolls and their stories.